« Curiosity arrives at Mars this weekend! Ever since the full moon of January 29, 2010, I’ve been wanting to catch another that was perfectly full. Not a day or even half a day early or late, but right on the button. I came pretty close last Wednesday, August 1. Here’s my best shot, taken with the Nikon Coolpix 4500 shooting through my Apex 127 Mak and 32mm Plossl. It’s hard to say if this moon is really perfectly full or not; in a way it is, and in a way it isn’t. I know that’s enigmatic, and I’ll clarify it at the end of the post. 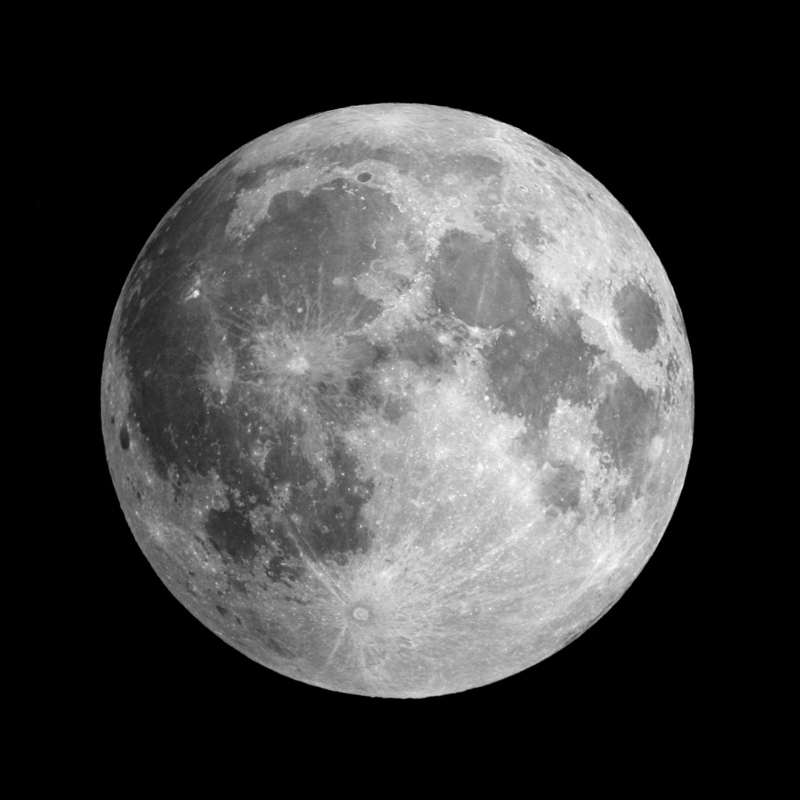 But first, compare last Wednesday’s full moon to the renowned (by me, anyway) January 29, 2010, moon. Here, let me make that comparison easier for you. As always, click for the big version. Two things here are worthy of note. First, there is a difference in illumination. On the left, the east side of the moon is better lit, and on the right, the west. More importantly, these pictures do not show the same stretch of moon! Check out this overlapped composite, with a few prominent landmarks labelled. All of the offsets are consistently in the southeast-northwest direction, and the two moons are perfectly overlapped at the periphery. The difference between the images is not because the photographs are rotated in two dimensions, but because the moon was differently rotated in three dimensions. This effect is called libration, and because of it we can see almost 60% of the lunar surface from Earth. Here’s the comparo again, this time with some of the limb features labelled. On January 29, 2010, the northwest limb of the moon was tipped toward us, allowing a good view of the “shore” of Oceanus Procellarum and some prominent rim craters like von Braun and its equally-spaced outriders Lavoisier A and Harding. Another useful landmark is the bright crater Seleucus, just to the east of the much larger, dark-floored Eddington. On the opposite limb, Mare Marginis and Mare Australe are barely visible, and Mare Smythii is just a dark patch on the limb itself. Now compare to last week’s fully moon. The northwest limb is rotated so far away that von Braun is completely lost, along with the rest of the shore of Oceanus Procellarum, and Eddington is a barely perceptible dark streak. On the other hand, the southeast limb shows excellent detail in Mare Australe, especially around the very dark-floored craters Lyot and Oken, and farther north we can see all the way across Mare Smythii to the lighter terrain beyond. Now, as to the “perfection” of the fullness: there is some terminator-like shadow and detail visible in my photo from last week, but not on the eastern limb where one might expect it. Instead, all of the visibly shadowed craters are around the south pole. This is where the story gets complicated. There are three widely-discussed causes of libration: (1) the moon leading or lagging, relative to its own rotation, along its eccentric orbital path; (2) the tilt of the moon’s axis relative to the plane of its orbit; and (3) rotation of the Earth, which from moonrise to moonset carries an Earthbound observer almost 8000 miles from west to east (which is why everything in the sky rises in the east–that’s the direction we’re constantly headed here on the surface). The moon is only 240,000 miles away, so this daily (or nightly) trip equals 1/30 of the distance from Earth to the moon. How much difference does that make? The average interocular distance for a human is 6.5 cm (2.5 inches), so look at something 30 times farther away (195 cm or just over 6 feet) first with one eye and then with the other. You just simulated diurnal libration. Now, as I noted above, the eastern limb of the moon is darker than the western side in last week’s photo. The Sky & Tel online almanac said max fullness would be at 8:37 PM, PDT. But the moon was just rising then, about four hours before it would cross the local meridian. 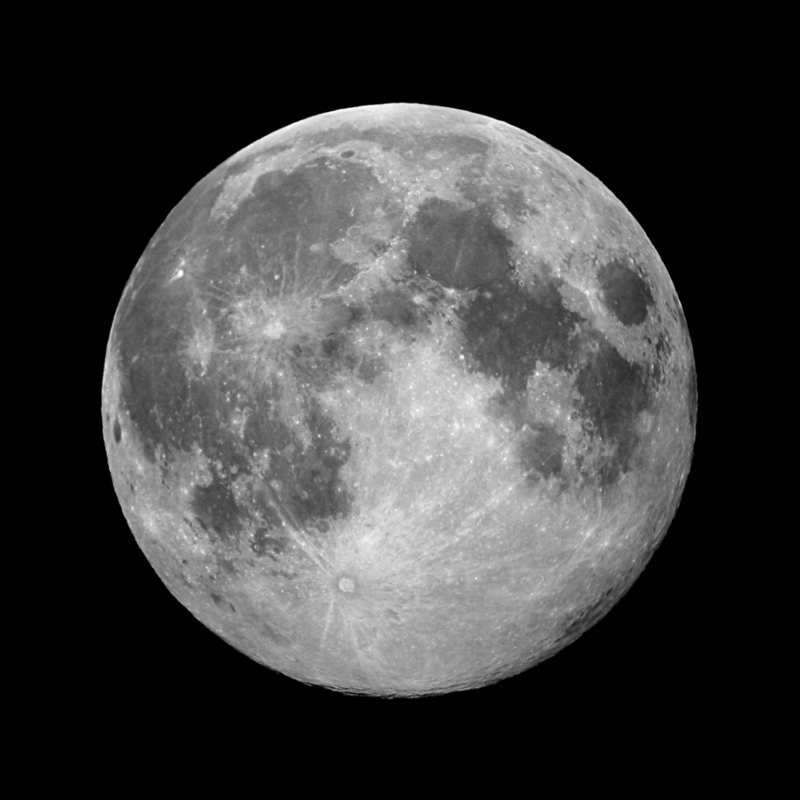 In other words, at max fullness the moon was dead overhead for people 4000 miles west of me, but the turning Earth wouldn’t carry me directly under the moon for another four hours–and by the time I got there, it wouldn’t be perfectly full anymore. I took the picture I used in this post at about 11:30–three hours too late for a perfectly full moon. I took other pictures at 8:37 and other times in between, but they turned out poorly–seeing near the horizon was rotten and my scope wasn’t properly cooled yet. So I’m pretty sure that diurnal libration–the effect of the turning Earth–accounts for the less-than-even illumination from east to west in my moon shot. But that doesn’t explain why there are shadows at the south pole. I assume that the alignment of the moon and Earth was such that I was looking up the moon’s skirts, so to speak–so far south, relative to the moon, that I could see past the illuminated area and into the shadowed highlands beyond. If that’s true, then observers in the Southern Hemisphere, being even farther “below” the moon, should have been able to see even farther into the shadowlands. Anyway, I had a lot of fun, and got a good look at some southeast limb features that I’d never seen before. I’m anxious to see what libration will bring me next. I’m not sure what measurements to be looking at, but there are a couple of observations I make. You might be covering these indirectly, but I popped through to Stellarium to see what things looked like to compare the two dates. 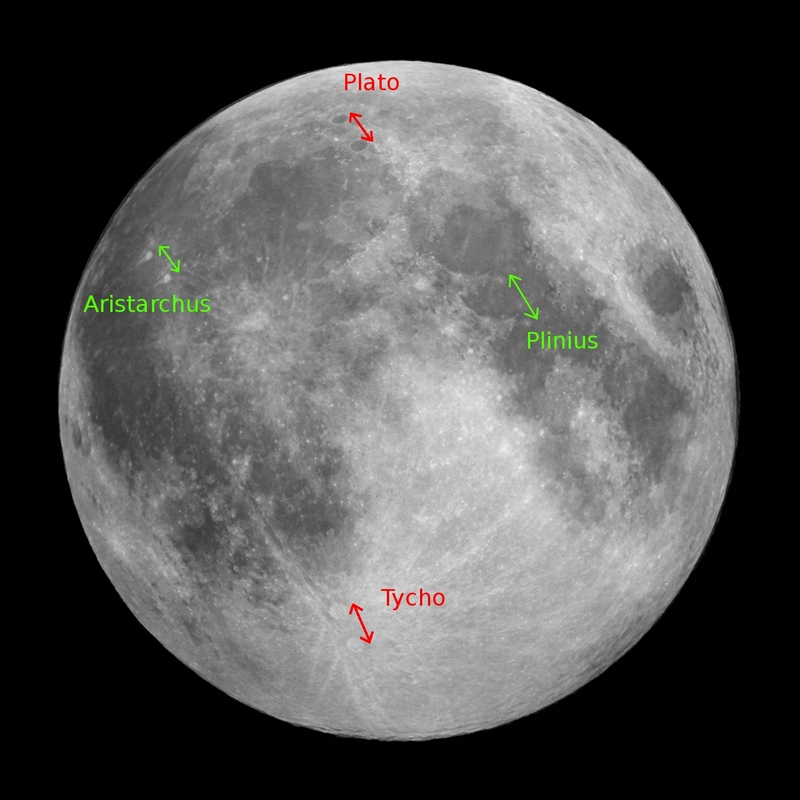 The moon is one object the varies widely where it rises, sets and arcs the sky. That in and of itself would mean it could have been higher in the sky, north/south, on one occasion vs. the other. But, the sun was also rising and setting from a different point, and in this case drastically, so that could effect the shadows. I’m not stating any of this as fact or proof, but just hypothesizing. If I have my numbers correct, on 1/29/2010 the moon was rising at around 69* and the sun was setting at 247*. On 8/1/2012 the moon was rising at 107* and the sun was setting at 287*. All these are somewhat rounded, but that would give both a drastic difference in the angle we would observe the moon (north/south tilt) and the angle relative to the sun (shadows). Make sense, or am I all out of whack?? I didn’t mark to notify on comments…..so will make another comment. I think what you are describing, of the earth angle, would explain east/west shift. That together with my hypothesis would explain a diagonal. Yes, I agree with all of that. In summer, the sun is higher in the sky and the nighttime moon is lower, and vice versa in winter. Intuitively, that should make it easier to see over the north pole of the moon in summer, and up under the south pole in winter. In this case, I guess the tilt of the moon trumped that effect. But it points the way to even more extreme librations, if the moon was tilted “up” as it was last week AND it was the middle of our northern hemisphere winter. My question would be: Is there an angle between the plane of Moons’s orbit about the Earth, and the plane of Earth’s orbit about the Sun? I guess there is (otherwise we would have a lot more lunar eclipses). This would explain why the southern pole of the Moon is not fully lit – the sun shines from above (slightly) and we look from below (slightly). To get a *real* full moon, it would have to be close to a lunar eclipse (if not almost, but not quite yet) – the closer the Moon is to lunar eclipse, the better. Maybe right before and right after an lunar eclipse? One caveat: This graphic is shown for the view from the north pole of the ecliptic. It shows that the moon is not a perfectly spherical, depending on the day, the spatial position of rotation of the moon, larger surfaces on full moon days can be seen.